Captain Chesley "Sully" Sullenberger was the guest of honor at a "Patient Safety Leadership Roundtable" hosted at MIT by a great group of people* from the Boston area. Many people know of Sully from the dramatic Hudson River emergency landing in January of 2009, but he also is an expert on quality and safety improvement in the air transport industry. 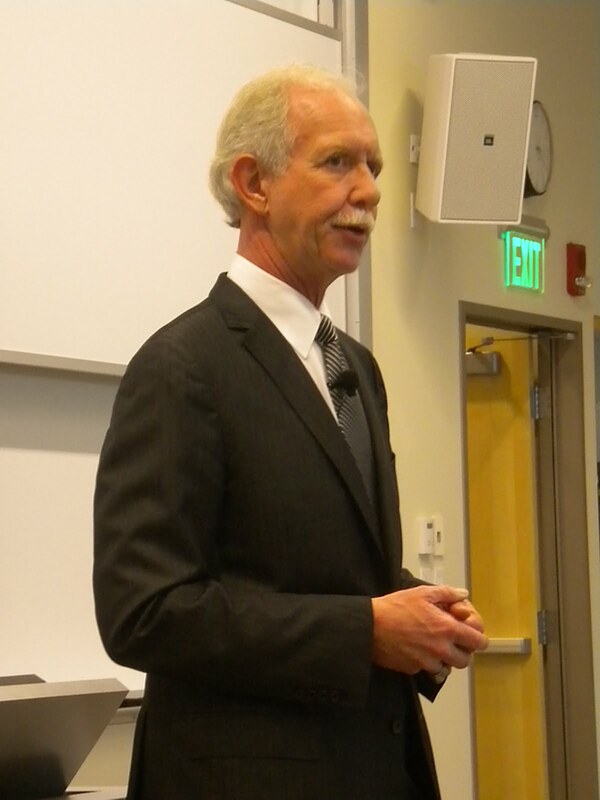 He was here to discuss possible applications of lessons learned from that industry to the health care field. A key one, of course, is the use of crew resource management techniques. He defined CRM as "a compact, with defined goals and responsibilities" among team members. He noted, "These are not soft skills. They are human skills. They have the potential to save more lives than new medical technologies." Referring to the current interest in checklists, he reminded the group: "A checklist alone is not sufficient. What makes it effective are the attitude, behavior and teamwork that go along with the use of it." When I suggested that, in health care, the implementation of CRM management also suggests inclusion of patients and families in the "crew," he concurred, saying, "We have to listen to expertise, wherever it comes from." He called on the group to apply a sense of urgency to this problem. Citing several publications, including this article on the temporal pattern of harm by Landrigan, et al, in the November 25, 2010, issue of the New England Journal of Medicine, he noted that there had been a flat rate of improvement in this field (charts excerpted below). "I wish we were less patient. We are choosing every day we go to work how many lives should be lost in this country." He remarked on the scattered application of systemic approaches to safety in the health care industry: "We have islands of excellence in a sea of systemic failures. We need to teach all practitioners the science of safety." * Jody Hoffer Gittell (Relational Coordination Research Collaborative, Brandeis University, MIT Leadership Center); John Carroll (MIT Sloan School, Lean Advancement Initiative); Jon Chilingerian (Brandeis University); Amy Edmondson (Harvard Business School, MIT Leadership Center); Ed Schein (MIT Sloan School, MIT Leadership Center). What a direct and hard-hitting set of quotes from him. Any one could stand alone as a wake-up call; taken together, I find they make me ashamed as a physician. Like a student caught not trying hard enough. Sulley’s comment about the importance of attitude, behavior and teamwork as it relates to the use of checklists is extremely important. The challenge is how to get doctors, especially surgeons, to embrace this to the point where nurses, techs and other staff feel empowered to speak up without fear of retribution or reprimand if they notice something wrong especially if it’s something the doctor is doing or not doing but should be. I would suggest we then start focusing on these issues instead of wasting providers time with the collection of worthless data and computer entries that have not been documented to increase patient safety. While the goverment and other payors seemingly want data to bring quality into the equation of payment, they seeemingly want this for free and at the expense of caregivers doing the documentation and data entry. This will only serve to divert our attention from the things we know really matter and are not likely to add to safety or quality improvements. CMS and P4P are inadequate for the same reason patient satisfaction measures are inadequate. They are not timely, they are information-in rather than -out, and they are not sensitive to some of the strongest predictors of harm, such as hierarchy, siloing, and care modeled around physician interest rather than patient need. But I'm not sure that teaching "the science of safety" is adequate either. The tools are critical, but unlikely to be adopted wholesale if medicine does not think differently about the very definition of what physicians do. Academics need to become as hungry about data on care as they are about data in their labs. Patients, hospitals, and physician organizations have even more incentive with ACO risk contracts to improve and push new information in new ways. Isn't it time for MIT to start a med school? Now THAT would be disruptive innovation! As a big fan of Capt. Sully, the pilot who successfully landed the plane on the Hudson River in the U.S., I am so glad to hear he's using his expertise to improve patient safety in hospitals. Great work again, Capt. Sully! In my experience as an anesthesiologist in a busy metro trauma center, most errors are due to the over-confidence that comes with experience; we assume that what we're seeing is within the realms of "normal," is manageable, is benign, is an artifact, is not important in the bigger picture, etc. Blindness to Truth is an acquired disease. You can be wrong many times before it comes back to haunt you. As a partner of mine often notes: "It's really hard to kill someone." If it were easy, it wouldn't be for long. This is called "normalization of deviance" and was used to describe the events leading to the Challenger launch decision. He is so right. It is more than checklists. It is attitudes and having the right mindset. Yet ironically the training in becoming a doctor or RN is vastly different than the military, where teamwork is literally drilled in on day one in the latter while the former values individual perseverance. Until that changes, it will be difficult to move the culture of medicine to where it should be. There is a complex interdependence between the individuals and the organization - external explicit rules can become over-ridden by local subliminal cultural normalization. See http://onlinelibrary.wiley.com/doi/10.1111/1467-9566.12370/full for an excellent cross-cultural ethnographic study of these factors & relationships. It's not simple! Or, it's simple but not easy! Do they really do that? Don't worry. High quality exists elsewhere. They have heard. Are they ready? ACO rules: Where's the beef?